I noticed that there are finally hall monitors on Wizard101! You may think I'm excited about this but the truth is I'm not. I'm not excited because people could behave the way they should without Hall Monitors on the game. I am glad Kingsisle finally did send them in though. They were needed for so long! I'm going to give a a few reasons why they were probably added to the game.. This was probably the main reason Hall Monitors were added to the game. If you walked through the commons for a few seconds to get to the bazaar on an average... lets say Monday, you will noticed that when you open your chat box there's a lot of bad language that people are using in your chat box! Remember you only went to the bazaar. This may be the second reason but its also a huge reason. Along with bad language in a chat box is bullying. One time I had to go back to the commons because I noticed that someone was being very mean to someone and I told that person to stop. This was in January of 2011, probably when things started getting worse in the commons. That's simple! Don't use bad language and stop bullying, we don't know how long HM's will be here, they may be here quite some time. We can show them that we do know how to behave in the commons though even if they are, not only the commons but everywhere on the game. Its not that difficult. I hate to bring up bad news from last year but we created WCP to try to help and didn't know that it was against the rules in any way, I had my report option taken away because of that. You may think I might be mad at KI because of that but I'm not at all! That would be silly, I'm glad they told me in that way instead of a ban though, or there wouldn't even be a post right now. The HM are not like that group, they are people who were selected as HM, and they will help Kingsisle with the game. They aren't going around reporting everyone they see! They are reporting those who are not following rules. Everyone has to follow rules, in life and on the game, if you try to you'll see how much better it is. Don't act like someone you're not.. This is very important, if you're in the commons don't go there to act like Kingsisle OR a HM. Kingsisle knows who their employees and helpers are, they won't let you do that. You may be banned for acting like a Kingsisle employee, right now I don't know about the HM's but that might be the same thing in my words. Respect, Responsibility, Honesty, Self Control. Let's make the game better with those things! Yelling at the HM's about them being there won't work, lets think of the reason on how they arrived? Lets try to change the game one gnome at a time! Comment below and tell me if you think about KI having Hall Monitors! 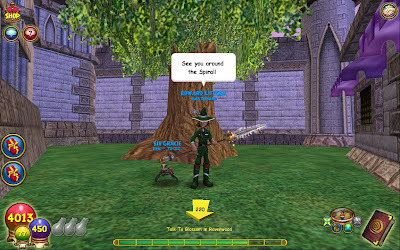 Edward even though I barely get time to view your blog, you are right about them adding HM, this stuff needs to stop.The people breaking the rules still will get punishments what they do/say in these areas.The HMs will be around the spiral from Dragonsype to Valencia in all the 101 games, and maybe all of future games Kingsisle has.But the people who got HM status and broke the rules will become lucky unless there is KI support (like friendly) in there area secretly watching chat as the HM(s) break the rules.So both ways, there may be someone breaking them.